02/12/2018 - Let's talk about death. 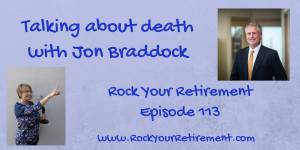 Jon Braddock talks to Rock Your Retirement about how important is it to help family know what you want or have planned to lessen the hardship they will face after your death. 01/01/2018 - The best time to start your end-of-life planning is today. Jon shares his story with Helen Nash Bauer and Jerry Fenter of The Heart of Hospice with a lot of warmth and humor. We can all learn from his experience. 11/22/2017 - Do you have end-of-life plans? Most people avoid thinking about life after they pass to avoid having difficult conversations or getting overwhelmed by the logistics. But you wouldn’t want to leave your loved ones with a lifetime of belongings and information to sort through, so how can you unburden your family members before it’s too late? In this podcast, Jon talks with Charlie Hoehn about how to thoughtfully prepare for your own passing. 11/21/2017 - Today’s deceased leave a messy legacy of paper files, digital documents, and all sorts of other records – scattered everywhere, resisting even the most valiant attempts to bring a measure of order to their unmitigated chaos. Listen in as Jon talks with Summer Felix from The Draw Shop about the most important things you need to know about end-of-life planning, and how to start preparing successfully. 11/16/2017 - Jon joins Colin Meeks of Maryland Financial Advocates for the podcast, "You are going to die someday, so let's talk about it." 11/14/2017 - The Ultimate Gift: Leaving your family a clear blueprint to your financial wishes. Death and taxes are inevitable and while you may be able to cheat on taxes, you can't cheat death. Listen in as Jon talks with Rocky Lalvani of Richer Soul about how to prepare your estate and leave clear instructions. 10/29/2017 - Don't Leave a Mess Behind After You Die. Jon chats with Frank Samson from Senior Care Authority about being thoughtfully prepared. Click here to listen to the conversation. 10/9/2017 - Jon Braddock talks about losing loved ones and the process of making sure their wishes were taken care of on The Art of Abundance with Leisa Peterson. Jon and Michelle Braddock spent 36 years working in the insurance business helping large employers assist their employees with their coverage options. Then something personal occurred in their lives and everything changed. Click here to listen as Jon and Michelle share their story with Kimberly C. Paul of Death by Design. It's About How You Live, hosted by Tina Ketchie Stearns with Jon Braddock, is about how to take the fear out of conversations about advance care planning, serious illness, and end-of-life care. Click here to watch or listen to Jon's message about being "thoughtfully prepared." Listen in as Jon Braddock and Benjamin Brandt of Retirement Starts Today Radio discuss the importance of end of life planning and the real reasons people avoid making end-of-life planning decisions. Be sure to listen to the very end where Jon and Benjamin vent their shared frustrations with planning for long term care needs.